Is Robert the Bruce kind of like being Kevin the Martin or Sally the Karen? I kid, I kid. Robert the Bruce led the Scots to victory during the First War of Scottish Independence in the late 13th century. He led an extremely complicated yet notable life, which you can read about here . Scotland’s unique ability is called “Scottish Enlightenment.” Happy and ecstatic cities receive additional Science and Production. They also receive additional Great Scientist points from Campuses and Great Engineer points from Industrial Zones. Scotland’s unique improvement is the Golf Course, for some reason, and that is hilarious. The golf course. Hah! This provides an Amenity as well as Gold, and additional Culture if adjacent to an Entertainment District. Later in the game, the Golf Course also provides additional Tourism and Housing bonuses. Golf Course tiles cannot be swapped or placed in the Desert and Desert Hills terrain type. Scotland’s unique unit is the Highlander, Scotland’s feared and respected military unit. This reconnaissance unit replaces the Ranger and receives a combat bonus when fighting in Hills and Woods. Robert’s unique ability is “Bannockburn,” named after the historic Battle of Bannockburn that served as a turning point in the Wars of Scottish Independence. After researching the Defensive Tactics civic, Robert can declare a War of Liberation. After war is declared, Robert receives additional movements to units and production to cities in the war’s opening turns. Though Robert is a strong military leader, War Weariness is still a major concern. Populating Scotland with Golf Courses (hah!) will help stave off this issue so that Robert can reap the full benefits of Scotland’s unique ability. Scotland’s strengths lie in Science and Production, but with Robert’s military strengths, Scotland is a versatile civilization suitable for any victory type. What Civs Should We Hope For In Civilization 6: Rise and Fall? 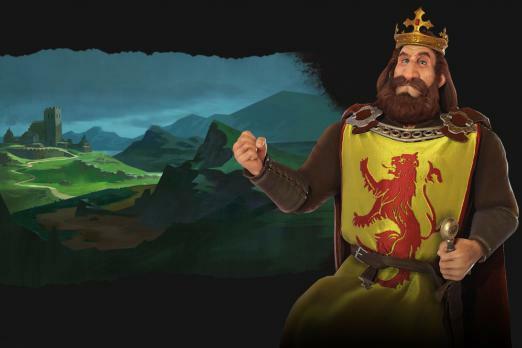 Robert the Bruce is one of the nine new leaders coming to Civilization 6: Rise and Fall on Feb. 8, 2018. Will you lead the Scots to victory, or has another civ struck your interest? How do you feel about combating war weariness with golf courses? Feel free to let us know in the comments section below.